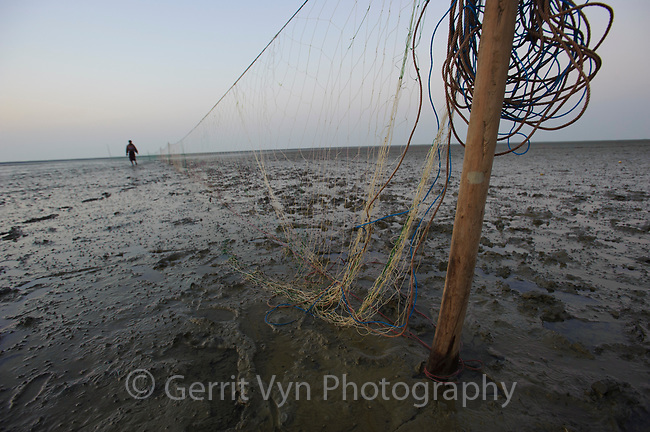 Fishing net strung across mudflats to catch birds at night. These opportunistic hunters were on a small island adjacent to Nan Thar. They were not regular hunters but were fishermen who occasionally hunt birds when fishing is poor. They captured several migratory shorebirds including Common Redshank, Terek Sandpiper, Eurasian Curlew, and godwits. Rakhine State, Myanmar. January.